A vast array of Crafts – Dining and Kitchen accessories brings convenience plus the great looks and durability of solid hardwood construction to your dining room and kitchen. 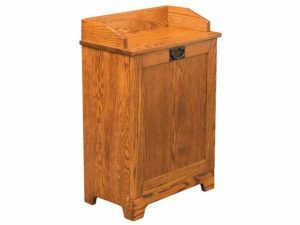 We offer cookbook holders, gumball machines, trash bag accessories, banana trees and bread boxes. Also, you’ll find butter churns, dry sinks, wine racks, paper towel holders and fruit bowls. In addition, we’re included ice cream spades, knife holders, ironing boards, mug trees and memo pads. Plus microwave hutches, plate displays, spice racks and serving trays. What’s more, the Midwest’s best Amish artisans carefully craft each piece. Also, the Amish men utilize regional hardwoods. So, with proper care, the pieces you select should last for generations to come. So check out our impressive online collection of Amish accessories. Or, visit our ‘brick and mortar’ store in picturesque Shipshewana, Indiana. And explore them for yourself. 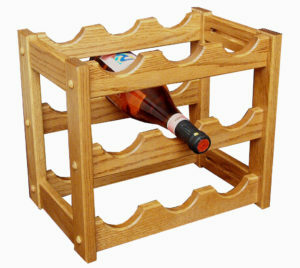 The Amish Solid Wood Wine Rack is a great kitchen accessory that will store up to nine of your favorite bottles of wine. Contact Weaver Furniture Sales for a price. Why choose dining and kitchen accessories from Weaver Furniture Sales? The answer is simple: solid hardwood construction by Amish artisans, wide selection and full customization. Solid hardwood construction. The best Amish craftsmen in the Midwest painstakingly handcraft each piece of Amish furniture. Also the Amish builders use solid hardwoods like maple, cherry, oak and hickory. As a result, each handcrafted item is incredibly sturdy. In fact, with proper care, the piece you choose should last for a very long time. Wide selection. As you can see from the collection, we’re offering a wide array of furniture accessories for your kitchen and dining room. Including trash bins, bread boxes, wine racks – and more! Full customization. You can order your favorite solid wood accessory as shown. Or we can build it to your specifications. Just tell us your preferences – like wood specie, finish, hardware, finished size and other options.